THE PICTURE OF HEALTH does not necessarily bring cellular physiology to mind. Rock-hard stomachs, dressing-on-the side salads, and unyielding self-discipline pervade society’s idea of healthy. But one researcher wants to turn our picture of health inside out. 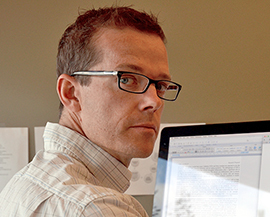 Over the past three years at UBC’s Okanagan campus, Assistant Professor Jonathan Little has worked in the School of Health and Exercise Sciences toward optimizing diet and exercise from a different perspective. Exercise and diet contribute to much more than a number on your scale, says Little of his current research that challenges our understanding of exercise and diet. Little’s fascination with the science of metabolism began as a competitive distance runner. He was intrigued by how the body produces and consumes fuel during these extended periods of endurance. Drawn to the physiology beyond the muscle in high-performance sports, he began to compare the athlete’s muscle with the muscle of a person with Type 2 diabetes. Little remembers the day his passion zeroed in on exercise physiology research. As an undergraduate summer research assistant, he recalls arriving to work with volunteer participant—and the study abruptly being called off. Not wanting to miss an opportunity, the team had to quickly design a new study around a new hypothesis. “That was the day I decided I wanted to be a researcher,” he says, captivated by the process of asking an interesting question and finding the route to the answer. Little pursued an MSc degree at the University of Saskatchewan focusing on sport nutrition, before completing his PhD focusing on muscle mitochondrial adaptations to exercise in healthy humans and individuals with Type 2 diabetes. More than one in four Canadians lives with diabetes or prediabetes, and this is predicted to rise to more than one in three by 2020 according to the Canadian Diabetes Association (CDA). Described as Canada at the Tipping Point, the CDA predicts the associated cost of diabetes in Canada to reach $16 billion by 2020. Regular physical exercise is identified as one of the most important things you can do to help reduce your risk of Type 2 diabetes; however, optimal exercise strategies are largely undefined. Little works with a cross-disciplinary team at UBC Okanagan to find optimal exercise strategies for Type 2 diabetes. “My goal is to provide evidence-based knowledge that can be used to prevent, treat and manage chronic disease through targeted exercise,” he says. Targeted exercise in Little’s lab includes a novel form of time-efficient exercise called HIIT—short for high-intensity interval training—which involves short bursts of activity separated by periods of rest. Little works with participants across the Okanagan valley to test his hypothesis that the intermittent nature of HIIT represents a uniquely superior form of exercise, when compared to traditional moderate-intensity continuous training and resistance training. The results are promising. However, some of the real-world application of Little’s research has him most excited. That is where real benefits are going to be realized, explains Little. With just one session of HIIT, participants can improve blood sugar, or glucose, levels. Little’s examination of exercise from the physiological perspective has been recognized by the Canadian Institutes for Health Research (CIHR) with a five-year scholar grant to continue his investigation into the efficacy of HIIT as an optimal exercise strategy for Type 2 diabetes. Little is not waiting five years to help people get started on the path to improving health. Little collaborates with community partners to mobilize the knowledge his lab is creating. A regular feature in the Canadian Diabetes Association webinar series, Little is passionate that people have evidence-based information on how to improve health. His latest webinar, ‘Why We Should Exercise,’ strives to help people take the first, and often the hardest, step. No stranger to juggling multiple professional and family demands, Little is a husband and father attuned to the hustle of children’s activities and everyday deadlines. Little overcame his personal obstacles to exercise by finding ways to integrate his own exercise with family time. For example, he recently joined his daughter in family karate classes instead of hitting the sidelines and watching. For the 2.5 million people living with Type 2 diabetes, Little’s research could mean the difference between coping with the chronic disease or thriving with it. “The goal of my research is to provide people with evidence-based exercise strategies that will not only help them get started, but keep them motivated to continue. We asked the School of Health and Exercise Sciences’ Jonathan Little to share three things that people should know about exercise. 1) Every bout of exercise you do, you experience benefits. Each time you exercise, you experience metabolic benefits for 24 to 48 hours after, which Little says not to underestimate. Just one 15-minute workout can influence your physiology, particularly your muscles’ ability to absorb glucose, or blood sugar. 2) There is no magic pill. Little says that too good to be true is exactly that. The optimal strategy for you is one that you enjoy and can stick to on a regular basis, he says. 3) Don’t focus on losing weight. Little adds that what is going on inside of you when you exercise is more important than what you see in the mirror. Use this as your motivation, he says. Even if you can only manage five minutes one day, know that you have changed your future with just those few minutes.